Introducing the complementary RIA Cybersecurity Risk Worksheet! 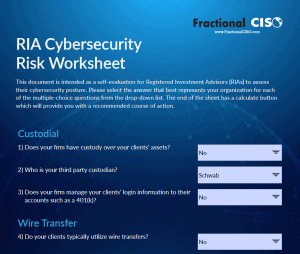 The RIA Cybersecurity Risk Worksheet is a great tool for Registered Investment Advisors (RIAs) to do a quick initial investigation into your firm’s cyber security practices. The risk worksheet is an eighteen question multiple choice self-evaluation of your firm’s current cybersecurity practices. After answering the questions, and pressing the calculate button you can assess how your firm stacks up in its cybersecurity preparedness. The worksheet is designed for a non-technical evaluator. Just answer the simple multiple choice questions. It should take less than ten minutes. The worksheet is provided at no charge by Fractional CISO. Fill out the request form here to get access to the worksheet.